We’ve all made a to-do list at some point in our lives. Perhaps to keep track of an important project, an attempt to stay organized, or just a way to handle the never-ending barrage of things we need to do. While to-do lists are supposed to save time and keep you organized, without proper time management techniques, they can become overwhelming and eventually useless. If you find your to-do lists are more bother than they’re worth, try some of these time management expert’s tips for creating a useful, organized, and truly time-saving list. An effective to-do list should only list the tasks that you may forget or overlook without writing them down. Listing routine, day-to-day tasks only clutters your list with things that you do by habit anyway. It’s tempting to list your to-do tasks by client, project, building, agency, etc. but while that may be how you think of them, it’s a lot more effective to group them by what kind of task they are, or more specifically, what you need to do to get this task done. For example, grouping all your phone calls together will help you blast through the list when you are in a place you can make phone calls, grouping all of the things you need to do online will help you get organized and get more things done when you get to a computer. Creating general tasks like “take care of the billing issue” is not the way to go. Instead, break the tasks down to their simplest actions. Think it will just clutter up your list? Think again. Not only will listing the tasks as specific items make it easier to categorize and get done, it will help keep track of exactly what the general project is up to. It’s also a nice feeling to check off the things you accomplished as you go. 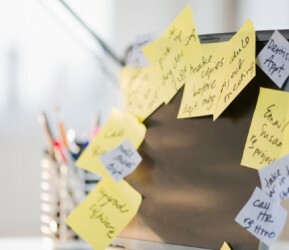 Place your to-do lists where you are prone to look throughout the day, such as your desk, near the phone, or keyboard. Having your list visible also means keeping other lists and clutter away. Hiding the list in a drawer or under a pile of papers on your desk is a sure way to guarantee the list becomes outdated and eventually useless. Use your lists every day and throughout the day. Once you get in the habit of adding items the correct way and checking them off when they are complete, you will not only save time and get more done, but your stress of getting things done will reduce as you gain trust in your to-do lists and rely on them more.